One of my favorite things about winter is the smell of oranges and clementines. I love the scent that is left on my hands after peeling them. So when this month's doTERRA product arrived from My Natural Family, I quickly started using it often. How did I use it? I quickly found that it helps flavor water. I have been craving a lot of citrus water recently-both with lemons and oranges. I put a few drops in a liter of water and leave it in the fridge. During the day, I get that water out and drink it. I have found it also helps energize me. When I'm feeling sluggish, I put the oil on my pulse points and it helps boost my energy. I'd love to get a diffuser soon, so I hope to get than in the next two months. My favorite essential oil was peppermint, but now it's a tossup between peppermint and wild orange. 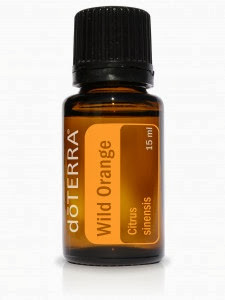 If you love the scent of oranges and need uplifting, I highly recommend doTERRA's Wild Orange Supplement. You can buy it from My Natural Family for $10.50 or enter to win one for yourself below. I am not really sure how I would use it if I won, because I've never tried it. I love love to get a diffuser to use it in I guess. I just received some wild orange from a friend and I also like it in water. I have not tried it yet, but would love to use it in my diffuser! Haven't tried it yet. I'll put some in the bath salts I make as gifts. I don't have the Wild Orange. But I would definitely put it in a diffuser. And in my water! Ooooh, and I'm going to get some wool dryer balls too and I'll probably use it on them to naturally scent my laundry. I use it in my laundry, as well as in my water. Would like to try, hope I win. Haven't tried Wild Orange. Loves that it helps with detoxing. I've never used it before. I would probably drink it in water. I am just now getting into different Doterra essential oils and can't wait to try this one for sure! ive not used it before, but i have heard good things about their oils.